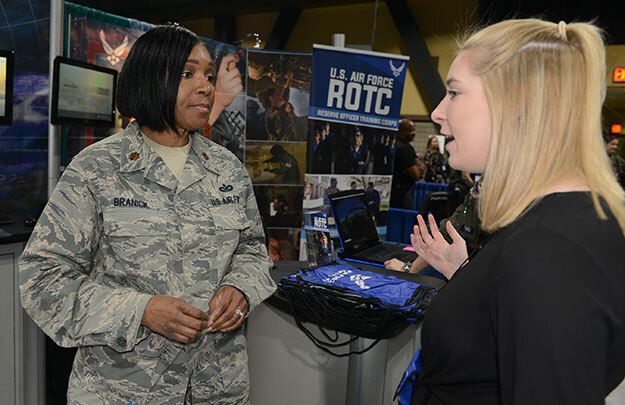 The Air Force's new integrated total force recruiting team put on a show of force at this year's Women in Aviation International conference in Long Beach, California. In previous years, the active-duty Air Force, Air Force Reserve, Air Force Academy and other parts of the Air Force would have separate booths throughout the huge convention. This year, the Air Force presence, with the exception of the Air National Guard, was consolidated into a pair of booths next to each other. The Air Force Personnel Center had a booth for recruiting civilians next to the total force booth that included the Air Force, Air Force Reserve, the Reserve Officer Training Corps, Junior ROTC, the Air Force Academy, Air Force Recruiting Service Detachment 1 and the Headquarters Air Force Aircrew Task Force (ACTF). "The concept of total force is great," said Senior Master Sgt. Deserie Jackson, an Air Force Reserve Command recruiter. "Having the components together side-by-side is a great concept because of the diversity of the crowd here. Some people are already full-time pilots who are looking for a way to serve part time. Some are just coming out of college and looking to serve full time. Having recruiters side-by-side allows for better customer service and we are able to capture more leads." "I enjoy all of us being here and getting to network," said Tech. Sgt. Reynaldo Perez Santiago, an active-duty recruiter in Encino, California. "We are all here as a whole representing the Air Force. I think it's a good thing to give people options whether it's active-duty Air Force, Air Force Reserve or the Guard." "There aren't a whole lot of female pilots out there," said Lt. Col. Otis Hooper, an Air Force Emergency Preparedness Liaison Officer representing Detachment 1 at the conference. "The Air Force is about 20 percent female as a whole, but only about five percent of pilots are female. So when you have an opportunity like WAI with more than 4,500 mostly female aviators, we like to provide as many resources as we can here to help match whatever it is they are trying to do in their life." Events like WAI allow the Air Force to reach out to populations that may have been under-recruited in the past. "I think it's very important, especially for the female demographic, because there are different things that tend to attract females to serving versus males," said Maj. Cynthia Johnston, outreach and engagement lead for the ACTF. "Having the total force here, we don't turn people off from the military because the first person they talked to didn't show them an option that worked for them. It's a great opportunity to show lots of different possibilities." A common theme for all of those working the WAI conference was providing better customer service to those interested in serving in the Air Force. "Anybody who has a mind to serve in our nation's fighting force can see there is a capacity and a way for them to be able to do that," said Maj. Sharon Branick, chief of Air Force ROTC recruiting. "To have all of us here together to share the pathway to service with them is awesome. I hope our ability to do that only gets stronger and better as we target the next generation of airmen. It shows we are one United States Air Force with many pathways to service. Having us all in one place shows that we are one force with many families." The Air Force has experienced a pilot shortage over the past few years. At the WAI conference, AFRS rolled out a new program called Pathway to Pilot, which included interviews with people interested in becoming a pilot. "We were scheduled to interview up to 50 potential candidates," Hooper said. "The light interviews, 15 to 20 minutes, allowed us the opportunity to know about the potential applicant and for them to know about the Air Force. One of the things we've found as a large obstacle or challenge is the application process. So we want to answer a lot of the questions up front that come up when an applicant goes through that process." Hooper admitted that the process to becoming a pilot can be frustrating at times. "Sometimes it can take up to two years for the entire process and a lot can change in someone's life in two years," he said. "So while someone is motivated and excited to apply and join the service, we want to capitalize on that and help them achieve their goals. It's as much about the Air Force meeting its demands and helping the candidate achieve what they want to do." Along with customer service improvement, the theme of recruiting diversity was on everyone's mind during the event. Hooper explained how an event like this changed his life and led him to become a pilot. "Part of the reason we come to events like this is because it's an incredible target of opportunity," he said. "It's all about providing access to communities or groups who may not have the opportunity to see someone who looks like them. I'm an African-American and a pilot, but I never thought about becoming a pilot until I saw the Tuskegee Airmen my sophomore year in college. That was the year the movie Red Tails came out, nearly 20 years ago. So when I heard the Tuskegee Airmen speak and I saw the movie, that was the inspiration for me to become a pilot." While this was one of the first of many events that will become the new normal for total force recruiting, there were lessons learned on how to improve the process. "It's a growing process," Jackson said. "Anytime you combine established processes into a new process, you are going to go through some of those growing pains to see what will work better next time."